How Much Do You Appreciate Your Roof? Our roofs have a tough lot in life. Rarely do we look at a house and exclaim “What a lovely roof you have!” – Instead, we’re focused on the architecture, the siding, the windows, and the landscaping. Roofs might be the function that keeps us dry and warm, but they are sorely under-appreciated. However, people do realize when a roof is looking… Unkempt. Those black streaks instantly detract from the overall aesthetic appeal of a property, making even the most beautiful home look worn down and messy. But there’s another, more important issue that stems from roofs that haven’t been properly maintained. Dirt, mold, and algae combine to create a formidable foe that can cause permanent damage. For residents in Gaithersburg, roof washing is particularly essential because the region’s humid, warm summers create a breeding ground for Gloeocapsa Magma, a bacteria that can spread like wildfire across your roof. Let Superior Pressure Washing Help! Superior Pressure Washing is proud to offer a solution. 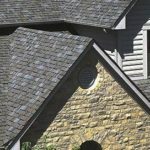 Our Low-No Pressure Washing technique is gentle yet effective, utilizing cleansers and a time-tested approach to systematically rid your roof of unsightly qualities and eliminate the risk of permanent damage. Let us provide a roof cleaning solution to your Gaithersburg home today!